Rain in the rice fields is a fortune, it rains in big cities is guaranteed to make resentful. 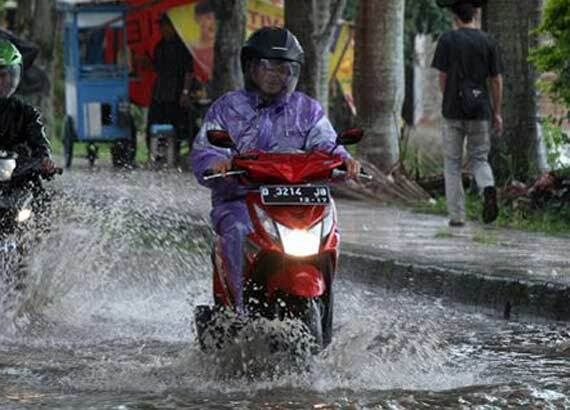 Each raining long enough, all segments streets in large kota2 turned into a sea. Ocean water and sea vehicles. Then there are concerns about how we break through the ocean. Most of you riders duck, probably already know the tips and tricks to deal with it. What about the scooter rider .. ?? Well, for scooter riders, here are tips as well. When facing a battlefield (read: puddles), take important decisions first. Among the flood hit the steering rod or rewind. The main thing that must be considered to find out is to figure out how much the water level on the exhaust vent and carburetor. Whether lower or higher? If more than that, do hope you can get away (if not convinced, mending select detour course ..) If you still want to go through the flood, try to position your body a little more advanced than usual. Then, place one leg forward and backward on the other foot, for example, the right front and left behind. The position is useful to keep the center of gravity and Handling. By positioning one foot backwards earlier, the expected weight will rest on the legs, making it easier for handling motor and body positioning when the floods hit. Try when passing through flooding, walk together with another vehicle in front of you, can bike or car. Position the front wheel of your motorcycle tires in parallel with the rear tires of vehicles in front of it. The closer your distance from the vehicle in front of you, the better. The goal, wheeled vehicle in front serves to divide a pool of water. So when passed, stagnant water has been split (by a vehicle in front was) and not as high as before bypassed. But you have to remain vigilant in case the vehicle is braking. If you finally break through safely, after the floods hit the service should do lightly or simply clear the existing components in such a CVT cover CVT belt, roller and pulley home. It is therefore important to prevent the risk of CVT belt or dirty and rusty. Well, if you are facing a puddle again, you do not need to worry about excessive.